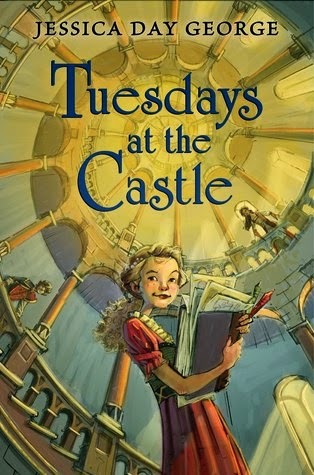 Tuesdays at the Castle is a delightful little story about kings and queens, wizards and magic, and a castle that has a personality all its own. Princess Celie's parents, King Glower the Seventy-ninth and Queen Celina, embark on what should have been a brief journey to attend eldest son Bran's graduation from the College of Wizardry. On the way home they are attacked by bandits and all three are presumed dead. Celie and her siblings Lilah and crown prince Rolf reel at the news as their world is flipped upside-down. To make matters worse, it appears that some of the courtiers are plotting with the evil Prince Khelsh from neighboring Vhervhine to take over the kingdom and the children don't know who they can trust. Fortunately, the castle is on their side. Castle Glower is no ordinary castle; it "wasn't just magic, but a living thing." It grows new rooms, stairways and hallways, and redecorates old ones to demonstrate its opinion of the occupants. (Prince Khelsh's rooms are small and dingy, while Celie's rooms are large, bright, and comfortable.) Doors appear or disappear at the castle's whim to help its friends and to stymie its enemies. In fact, it's even the castle that picks the new ruler, ejecting those it doesn't like and welcoming those it does. Celie has a special relationship with the castle, spending hours and hours of her childhood mapping its corridors and chambers, and becomes the foremost expert on navigating its odd ways. There were a few holes in the plot, and some unexplained motivations, so it's probably a good idea not to think too hard if you want to enjoy the story. (For example, if the castle didn't like Khelsh, why didn't it just expel him at the beginning? After all, "Cast Glower finds a way to get rid of chambermaids it doesn't like." And why on earth would the Emissary who'd served the king faithfully for his entire lifetime suddenly join with his enemies?) And the ending is a deus ex machina if I ever read one, but it's a fun, quick read and I see potential for the sequels.